Strike King's S11 Optics were scientificially engineered with high contrast lens which tailors the light spectrum to teh actively enhance the visual clarity for all fishing conditions and outdoor activities. 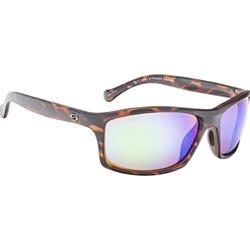 These polarized sunglasses have 11 layers of superior lens technology to help repel oils, dust and water which will prevent water spots and make them easy to clean. The also offer an anti-reflective coating which prevents light from bouncing off the rear of the lens to the eye resulting in a clearer, non distorted image. DAB (Dark Amber Brown) Lens - Great all around lens, terrific in cloudy conditions. Cloud Yellow Lens - Superb in low light conditions like early or late in the day & heavy overcast.